Senator George McGovern, poster child for unintended consequences of bad public policy crafted with questionable science. Why do the conventional low fat diet guidelines differ wildly from the low carbohydrate “nutrition equation” on the home page of this site? Why are we encouraged to restrict fat consumption and eat carbohydrates (sugars)? That’s because a forceful academic, Ancel Keys and his allies, in particular Mark Hegsted, made sweeping recommendations based on too little knowledge of human biology, promoting their preconceived ideas using questionable research, supported by powerful food companies with a vested interest in selling particular products. Hegsted had in fact been paid by the sugar industry for a review article that demonized fat and exonerated sugar. 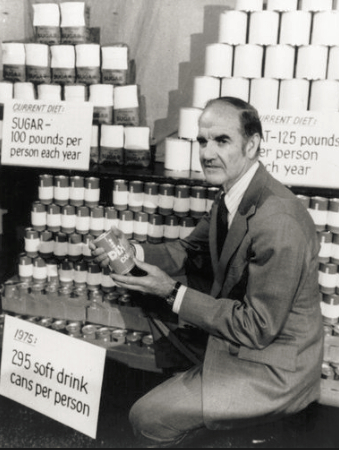 George McGovern, a politician who wanted to help society, embraced that view of diet and health plucked from a larger scientific debate because it matched his biases. These people enshrined incorrect science as national policy. That policy has had unintended consequences. As a society, we need to learn from a serious mistake. Most of the history summarized here comes from Gary Taubes’ book “Good Calories, Bad Calories,” and Nina Teicholz’ “The Big Fat Surprise,” which also gave me a stronger sense for just how biased the poor science was. I’ve added some information about energy and the sugar industry’s role. Before the 20th Century, Americans ate much more meat and animal products than their European cousins, a diet higher in fat and lower in carbohydrates. They were also generally healthier. The modern world, fueled by the cheap energy of the petroleum age, arose in the first half of the 20th Century. We developed modern economies of great wealth, applying discoveries made in science and technology, using even more fossil fuels, which generated more wealth in a positive feedback loop. This also resulted in accelerated population growth. In the early years of the 20th Century, meat and dairy production didn’t keep up with population, so people had to eat more plant products. Hydrogenated vegetable oils started to be used as cheaper alternatives to animal fats and butter, as I discuss in my review of “The Big Fat Surprise.” There was also a dramatic increase in sugar consumption as refined sugars became cheaper. The middle of the 20th Century also saw enormous increases in agricultural production of commodity crops like wheat, corn, and soybeans due to oil-powered machinery and petrochemicals. When vaccines and antibiotics came on the scene, prevention and treatment of infectious diseases were revolutionized. Particularly after World War II, Americans started to live in a very different world. With less mortality from infectious disease, death by heart disease became more visible. Heart disease was also becoming more common, due to the effects of the increased sugar consumption and possibly the hydrogenated (trans-fat) vegetable oils. The portion of the population most affected were the middle-aged men who dominated the wealth and power structures of our society. The American Heart Association (AHA) mounted a campaign to raise awareness of heart disease to promote their organization, and to get more money for their activities, trumpeting a need for research into the causes of heart disease. Science had began to measure more about the functioning of our bodies, including coarse measurements of the levels of the lipoprotein particles used as the fat transport system in our bloodstream, labelled “cholesterol,” one of the predominant molecules in those particles. Nutrition researcher Ancel Keys was a key member of the AHA’s nutrition committee, and a driving force in shaping thought in the field. Previously, on very limited information Keys had fixated on dietary fat as the supposed source of blood cholesterol, then tried to link elevated cholesterol levels to heart attack risk. He and others performed studies that weren’t objective science, but instead were designed to support their theories. Good science generates a hypothesis, then devises experiments to test the hypothesis, classically by trying to disprove it. Keys only reported results that matched his preconceptions, most notably in the famous “Seven Countries Study.” There were actually 22 countries in the UN database he had available, but he selected seven that best matched his biases. His sample sizes were smaller than would be considered acceptable by modern science. That handful of countries supported Keys’ thesis well. He loudly reported dietary fat correlations while largely ignoring sugar consumption. The amounts of sugar reported consumed were in fact better correlated with heart disease incidence, even in those seven countries. In one of his claimed healthiest countries, predominately Catholic, he surveyed men’s diets during Lent, then reported they didn’t eat meat, despite regular meat consumption the rest of the year. Other similar-minded public health researchers compared the diet of the early 20th Century to the diet after WW II as meat, poultry, and diary production caught up with population growth. They incorrectly linked the more visible problem of heart disease to saturated fats (animal fats) and elevated “bad” cholesterol. Excellent scientists disagreed based on other more objective studies. There was vigorous scientific debate in the 1950s and 1960s, going into the 1970s. Unfortunately other forces in society that weren’t science-based came into play. A movement to eat less meat and animal-derived fats took hold in some quarters, more for social reasons than health reasons. In particular, the vegan/vegetarian/environmental movement, which has much in common with religions, gained adherents, going beyond the legitimate science documenting environmental impacts of human activity. The event that turned questionable science into public policy was the report from Senator George McGovern’s Select Committee on Nutrition and Human Needs. The Dietary Goals for the United States was written primarily by an aide without scientific training. The aide, Nick Mottern, had distinct political and dietary biases regarding the meat, diary, and egg industries. He went on to run a vegetarian restaurant in later years. McGovern himself had participated in the extreme low fat Pritikin diet. For scientific support, they relied on Harvard nutritionist, Mark Hegsted, the ally of Keys. In 1965 Hegsted and others at Harvard were commissioned by the Sugar Research Foundation to write a review article for the New England Journal of Medicine exonerating sugar and blaming fat and cholesterol for heart disease. In the 1977 Dietary Goals report, it was advocated that the American population drastically cut fat in our diets and eat more “complex” carbohydrates, which implies plant products. More fruits, grains, and vegetables, less meat, eggs, and dairy products. A high-level political appointee in the U.S. Department of Agriculture, who was a low-fat advocate, turned those Goals into Dietary Guidelines used throughout the country. Members of the National Academy of Sciences who disagreed, and there were a number, were ignored or attacked. In fact, in 1978, Mark Hegsted was hired by the USDA to implement the guidelines. Money was provided for research and programs that reinforced the policy-driven dogma instead of asking proper basic science questions about how the human body worked. Researchers whose research didn’t support the dogma were ostracized. We began a massive national experiment, that has since become a world-wide one as our ideas, culture, companies, and products have spread across the globe. 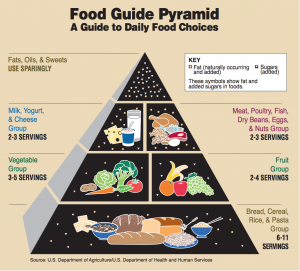 The nonsensical USDA Food Pyramid. It bears no relation to what the human animal evolved eating. Now let’s discuss the unintended consequences. On the face of it, a diet heavy on whole grains, fruits, and vegetables doesn’t sound bad, although it’s not optimal for the human animal. One problem is that wheat and corn varieties used for commodity agriculture have been bred for very high starch/sugar content, so those grains now have a much larger effect on blood sugar than they should. Corn went from less than 20% sugar content to around 40%. But the biggest problem with low fat food is that most of the substances that give food good taste dissolve in fat, then are carried to your taste buds and sense of smell. To remove fat from food, but to prevent the food tasting like cardboard, food companies needed to add something back–sweetness and saltiness were the easiest. So processed foods often got salt added, which turns out to amplify some of the problems I’ll list in the next paragraph. On the sweet side, at about the same time that these well-meaning people were promoting poor ideas as public policy, food researchers, typically funded by large food companies, were figuring out how to modify corn syrup, which consists mostly of the sugar glucose in water solution. Industrial chemists devised a process to cheaply convert about half of the glucose to another sugar, fructose, which occurs naturally in fruits. Fructose tastes very sweet to us. High fructose corn syrup (HFCS) is actually sweeter tasting than ordinary table sugar, which is made from sugar cane or sugar beets. We were and are growing truly vast quantities of corn, because extraordinary genetic breeding efforts combined with the machines and chemicals were generating huge harvests. Add to that commodity subsidies from the federal government supporting sustained production of corn, as well as wheat and other crops. What to do with all that corn? Make some of it into a cheap sweetener to add to the cardboard-tasting, low-fat food. Feed a lot of the corn to animals raised in captivity in unpleasant conditions, which I’ll discuss elsewhere. Problem solved. Or was it? Most people’s percent body fat has risen, dangerously so in many cases. Many more people have pre-diabetes, full blown diabetes, and heart disease. Hypertension and stoke incidence has risen, with the salt added to foods exacerbating that problem. Cancers have increased in frequency. More people are developing Alzheimer’s disease and other dementias late in life. Food allergy incidence has dramatically increased. Some of that might be due to the dangerous changes made to gluten precursors in wheat, but Dr. Richard Johnson says the uric acid produced by the liver’s metabolism of fructose makes the digestive tract more permeable, allowing food molecules into the bloodstream, causing an immune response that can become an allergy. Autism spectrum disorder is more common, as is Attention Deficit Disorder. Incidence of depression and other serious behavioral disorders has soared. We are told to exercise, but it doesn’t seem to do much good. The causes of these diseases are discussed in the Bad section of the website. They are all either clearly due to toxic high sugar diets, or have a strong potential link. From the movie Fed Up, I also realized that the Dietary Guidelines essentially mandated the expansion of the processed food industry–manufactured food. Removing fat from food and replacing it with sugar and salt is an industrial process, resulting in products that have may little to do with their agricultural sources. Looking at the Center for Disease Control’s Deaths and Mortality page, there were almost 2.6 million deaths in the U.S. in 2013. Close to 1.5 million of those deaths were due to heart disease, stroke, diabetes, Alzheimer’s disease, and cancer, diseases likely caused by high sugar diets. Driven by the public policy requirements, which have also become embedded in legislation, we’ve developed a government-funded infrastructure designed to conduct programs of education, research, and food production support that reinforces this unhealthy paradigm. This is unlikely to change until a critical mass of our population challenges the poor diet recommendations. That certainly means science, medicine, and public health professionals, but any of us can look at the evidence and form our own opinions. Anyone can try the healthy low carbohydrate/sugar, high fat diet I discuss in How To and see the results first hand. I was just as guilty as most of vaguely buying into the low fat, high carb dogma for decades until I read about newer paradigms and mechanisms in Gary Taubes “Why We Get Fat.” I showed the evidence to my M.D. wife, my Ph.D. father, my former schoolteacher mother, some Ph.D. psychologist friends, some athlete friends, and many others. It was new information to all of us. Then I saw changes in people I knew that I couldn’t explain when they adopted a low carb diet. That really increased my interest in understanding what was happening to their bodies and brains. Mine, too, once I made the change. Looking around, we still see the old, incorrect paradigms are dominant. We need to reach a critical mass of understanding of implications of the emerging science of human nutrition biology, and a shift in policy. Fortunately, more and more people are challenging the paradigm and speaking out, as well as developing programs to teach healthy nutrition.